Cutting down healthy trees in Oakville may soon become more expensive and difficult. Council voted Monday night (Oct.17) to move forward a proposal to enhance the Town’s private tree protection bylaw. An amendment to the bylaw would require property owners to get a permit if they wish to remove a private tree. They may also be required to plant a new tree as compensation. The proposed changes will come before council for final approval in early 2017 pending Budget Committee approval in December. Previously, property owners could remove four trees a year, with no permit, provided those trees were no larger than 76 cm in diameter. This policy also required no replanting. In a report to council, Town Staff said the existing bylaw has permitted too many healthy trees to be cut down and has negatively impacted Oakville’s tree canopy. “It is estimated that since the implementation of the private tree protection bylaw in 2008, more than one per cent of the town’s tree canopy has been removed without compensation under the current notification provisions of the bylaw,” stated Parks and Open Space Director Chris Mark in the report. From 2012 to July 31, 2016 alone Town staff estimated Oakville lost 5,852 healthy trees. Under the revised bylaw, any tree 15 cm (in diameter at breast height) and above to be removed from private property is required to have a permit and payment of applicable fees. The amendment also requires any healthy tree above 15 cm in diameter removed from private property to be replaced. The proposed fees would start at $50 for the removal of the first tree (15cm-24cm). Each additional tree removal after that would cost $325. The removal of dead or dying trees would still require a permit, however, there would be no fees. “Oakville’s tree canopy is a community asset, and council is committed to protecting and enhancing it wherever possible,” said Oakville Mayor Rob Burton in a press release. In the report to council Mark noted that while the number of trees cut down through the private tree bylaw permit process is expected to be the same, the recommended changes to the bylaw will prompt more replanting and will help offset any negative impact to the community canopy. 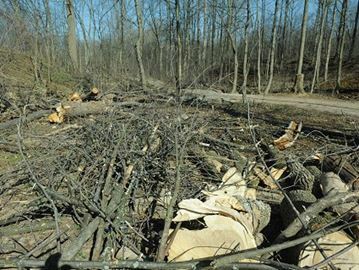 Oakville Ward 2 Councillor Cathy Duddeck called for great public notification of when someone has applied to take down a number of trees in a neighbourhood. The proposed changes to the bylaw were well received by a number of residents. Janet Haslett-Theall of the Joshua Creek Residents Association said she supported the amendment, but called for increased enforcement of the bylaw and increased penalties for violations. She said it is equally important to address the loss of tree canopy on lands that are under development and called for more work to properly address this issue. Oakvillegreen Conservation Association President Karen Brock said her group strongly supports the proposed amendment. “Trees need the same type of protections that we put in place to keep our air and water healthy for all our citizens,” said Brock.